Freshwater Fish Identification is most complicated when sorting between different types of the same species. For example there are 5 common types of Pacific Salmon that are found in and around Alaska - Chum, Sockeye, King/Chinook, Silver, and Pink Salmon. Alaskan fishing guides will pass on a simple pneumonic using your fingers and thumb in order to remember these different fish. 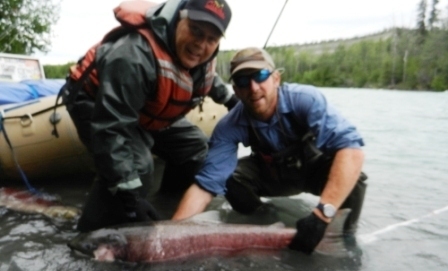 Click on the link below If you have not ever seen the salmon run, then plan a trip to Alaska Alaska Salmon Runs . Even though freshwater fish share many of the same characteristics, even the same basic structure, with practice different species are easy to identify. There are multiple reasons to be able to identify the fish you are work so hard to catch. Each state sets their own rules and regulations in terms of limits, and seasons for each species of fish. In some cases regulations require you to manage your catch with a slot limit. For example many Canadian waters have a slot limit for Walleye. You may only keep Walleye that are within a size range for example from 14-18 inches. (13 3/4 to 17 3/4 inches) You also will have a daily limit and a possession limit. If you are from the United States fishing in Canada and wish to bring home Walleye, you must be certain you know these regulations and be able to demonstrate what is in your possession to the appropriate authorities. In addition, Canadian regulations require you to leave a patch of skin on your fillet so that it can be identified. If you are not sure of freshwater fish identification and/or don't know the specific regulation, or you will have a limited time to fish a specific body of water, it is a good idea to hire a reputable guide who will know the season, know the limits, know where and how to fish with the most success. This is the best way to optimize your time on the water.